Lance-Bombardier Edwin Robinson, M.M., 1100421 Royal Regiment of Artillery. Edwin Robinson was born in Ossett in July 1915, the son of Flushdyke miner George Robinson and his wife Emma Hemingway, who married in Ossett on the 27th December 1913. Edwin Robinson married Gladys Horner in Ossett in early 1937 and they had a son, Keith Robinson, also in 1937, born in the Keighley area. 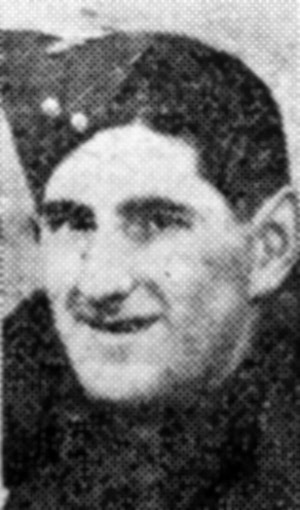 "A Military Medal For An Ossett Soldier - An Ossett man, Lance-Bombardier Edwin Robinson (30), whose parents, Mr. and Mrs. George Robinson, reside at 9, South View Terrace, Flushdyke, Ossett, and whose wife lives at Northampton, has been awarded the Military Medal for bravery in the field in Germany. The news comes from his wife who is the eldest daughter of Mr. and Mrs. J.E. Horner, 14, Naylor Street, Ossett. She writes that her husband received the award on his sister Kitty's wedding day, but he gives no details of the deed which merited it. His mother, however, believes that Edwin earned his medal in a recent fight, where, he writes, he captured eight Germans, including one officer. Lance Bombardier Robinson has been a soldier for four years, and abroad for ten months, having fought in France, Belgium, Holland and Germany. He was educated at Flushdyke Council School, and was employed from the age of 14 to 21 years by Messrs. John Palmerley and Son, Ossett. When 21, he went to work for John Hawkins and Son, by whom he was employed at the time he joined the Army. As a boy, he was a member of the Church Lads Brigade at Holy Trinity. He was a bugler in the latter movement, and has on several occasions sounded the 'Last Post' at the Ossett Cenotaph on Armistice Day parades. He was a keen all-round sportsman, being a good swimmer and playing locally at football and cricket. He has one sone aged eight years.